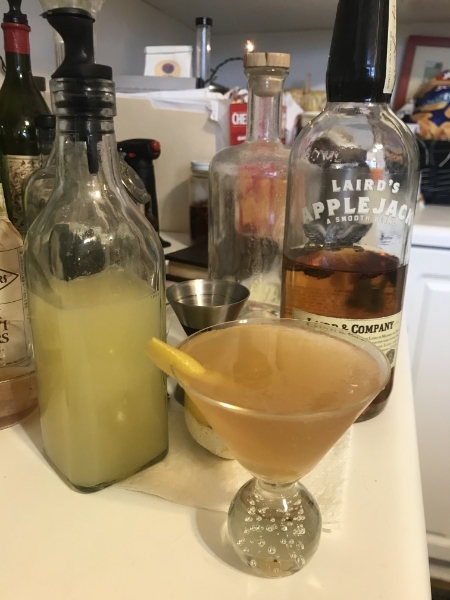 It’s the holiday time, and we have found ourselves with more than the usual amount of Laird’s Applejack Brandy lying about (long story), so here’s my first and obvious cocktail thereby: the Apple Pie, Jack. It truly tastes like an apple pie. Add the vanilla beans to the vodka. Let soak in a cool, dark place for 2–3 days or until desired vanilla taste is reached. Add the 1/4 cup simple syrup. Combine all ingredients in a pan. Bring to a boil and boil until all sugar is dissolved. Cool, cover, and allow to come to room temperature. Add vodka (for preservative), store. I have not tried this with store-bought vanilla vodka; I expect it might have a harsher taste.